Roy*, a male participant at a gender workshop tweets on gender discussions ongoing in the meeting. Roy* immediately receives a call from a fellow man: “What are you doing at a gender workshop?” Roy* shares this with fellow participants at the workshop to everyone’s utmost shock and sarcastic laughter followed by heated conversations with a mixture of grunts from one side of the audience, rolling eyes from another and nods from the corner section. Gender norms and power plays demonstrated above are not only at this high level but also influence the work community health workers (CHWs) do at the household level, community level and societal level. Harmful gender norms shape vulnerability to ill health and impact on health seeking behavior and access to health services in negative ways. 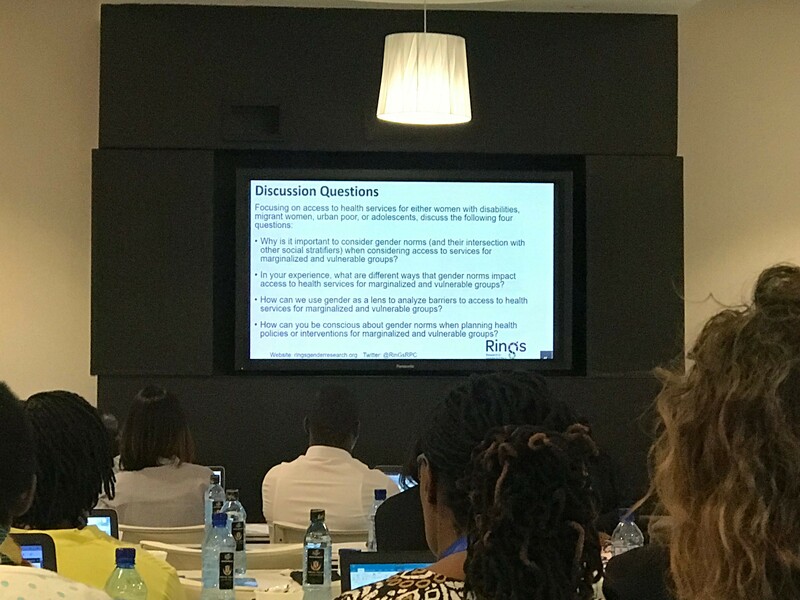 During a recent meeting in Nairobi on Building Health Systems that transform gender norms, participants concurred that with support, CHWs are well positioned to challenge gender norms as they are the interface between communities and the health system and are intimately aware of how they play out. Despite the very essential role that they perform, CHWs continue to experience perennial challenges like under- or lack of remuneration as well as the lack of motivation. In the course of the meeting in Nairobi, findings from diverse contexts revealed that In Uganda just like in other countries, CHWs are selected by their communities and are required to have some level of education. Many of the CHWs are women because of the voluntary nature of the job. More men were recruited in Sierra Leone because they have easier access to education hence more are educated. In Kenya, most CHVs are women, with a few men. CHWs are subject to gender norms that play out in their communities. In many contexts, roles are divided between men and women for reasons such as people in the community prefer getting help and services from a CHW of a similar gender. The different genders are also sometimes expected to perform different roles; for example, in Uganda community mobilization and responding to emergencies is heavily dependent on male CHWs because they have access to transport. Activities that require manual labor are also usually for the male CHWs. Female CHWs played more active roles in maternal and child health, handling sick children/people as most are already mothers. Women CHWs are tasked with more roles as they are considered more available than men because most men work longer distances away from home. All the aforementioned reasons reinforce the importance of having both genders as they all play different roles and it has policy implications. Charity Tauta from Kenya said, “It is vital to have gender mainstreaming in policy.” In order to do this, deliberate strategies need to be undertaken to encourage gender equity. Gender sensitive indicators and tools need to be incorporated into projects and programmes that are implemented with the help of CHWs. There is also need to empower representation of marginalized groups like women and encourage them to speak out. At the end of the meeting, Prof. Sarah Ssali powerfully wrapped up the meeting by reminding all present participants that as we strategize and plan forward, there is need to remember that culture and other factors that influence gender norms are dynamic and there is need for people to constantly be alert and cognizant of this.